Time is a very interesting concept – sometimes it seems to move slowly, and sometimes quickly. Lately, it has felt as if weeks have passed at the pace of months and months have passed at the pace of years. At first, I thought that this just might be the product of the process of waiting to hear back on the results of job interviews. However, yesterday I attended an event on the campus of my alma mater, where I found myself overwhelmed by these thoughts of the pace of time. After having left the United States in late 2012 for Europe for various internships and language studies and after having lived on my own in different cities, I found it strange to find myself inundated by the student culture once again – the fraternity t-shirts, the obnoxious flirting, the discomfort by which the students talked with faculty, the constant talk of alcohol by students as if alcohol is something new, etc. I felt extremely out of place: as if I had left behind all aspects of this lifestyle years before. Although it is clear that I have personally grown a great deal in the past year, interestingly, nothing seems to have changed in Spartanburg, South Carolina. (Granted, a popular neighborhood bar has closed up and moved across town – a noteworthy scandal for most all.) I would venture to say that time moves very slowly in most all small southern towns. In fact, with very few exceptions, it seems as if nothing has changed in this town – or even this state - since I was a little girl. Most of the textile mills which caused great growth in my region in the early 20th century had already closed by the time I was young – the working class subsequently un- or under-employed; abandoned mill buildings present throughout the city, and a growing movement of businesses in other industries moving out to more lively towns. The concept of time and the pace by which time moves were underlying thoughts of mine as I read my fifth book about the country of Venezuela. 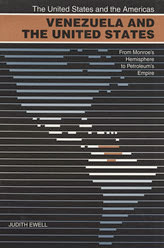 I bought the book, Venezuela and the United States: From Monroe’s Hemisphere to Petroleum’s Empire “new” from Amazon. I could tell that when I opened it, I was the first one who had done so – there were no spine creases, the “new book smell” wafted up to my nostrils providing me with an ecstatic high, the pages were taut and clean, and the cover was jet black and glossy. However, this book by Judith Ewell was no new book: Published in 1996 by the University of Georgia Press, this book predates the era of Hugo Chavez. Although Chavez had tried to stage a military coup in 1992, the author did not seem to believe this to be significant in any way: Chavez’s name is not even mentioned in the Index. This book, which chronicles the development of United States and Venezuelan diplomatic relations throughout the history of both nations, is subsequently inapplicable in regard to its predictions about the potential developments of relations between these two countries. The author ends the book by offering this point to ponder (which although still a point to ponder in US-Venezuelan relations – is certainly not the most important point to ponder! ), “Only time would tell whether the postwar changes implied a real, or a prematurely announced, death of U.S. hegemony in the hemisphere.” (page 224) Reading this “new” book, I found it amazing how the dialogue regarding Venezuela had completely changed since the publishing of this book in 1996. (Note: Chavez won the 1998 Venezuelan presidential elections and the following year, he replaced the Venezuelan constitution in place since 1961 with the so-called “Bolivarian Constitution.”) Growing up in an area with so few changes, to imagine a country where the political discourse and social problems could change virtually overnight was extremely interesting to me. At the same time, I enjoyed viewing U.S.-Venezuelan relations without using the lens of Chavez – which all more recent books have. It gave me a better understanding of not only the relations between the two countries, but also made me think about what role the United States should take in regard to other countries in this hemisphere.